As a middle blocker....what rules or volleyball blocking strategies do you need to remember to be effective in stopping the opponent's attack at the net? 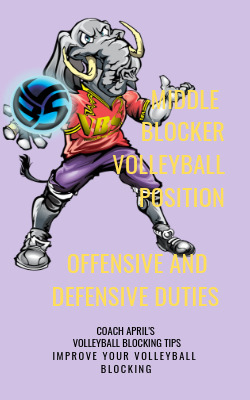 Whether your coach decides the defensive strategies or you are on a team where the players make the choice, as a middle blocker , its important for a decision or a game plan to be formed, a strategy developed so the front row and the back row work together in defense and everybody is on the same page about each other's responsibilities. One important strategy you as a front row player on defense should remember is to commit to only taking one area of the court away when you are blocking an opponent. As a middle blocker you need to learn to read the opposing team's hitter in front of you for clues as to how she intends to attack the ball. Its important to keep your eyes on the hitter, her arm, which will give you early indications as to whether she will hit the ball and in which direction she plans to do it, either down the line or cross court. As a blocker in the front row, your job is to be efficient and disciplined enough to only take ONE of these directions away. 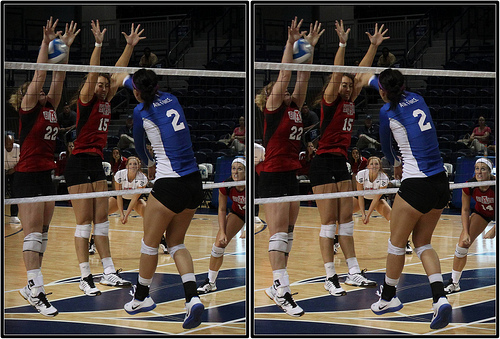 In the above picture of the Arkansas blocker volleyball, it looks like the blocking strategy was to take away the line area from the hitter in the blue jersey wearing no. 2 which they did successfully. Notice that had the hitter decided to hit the ball cross court, the red team's libero who can be seen wearing the white jersey was clearly ready to do her job which was to dig any of that hitter's cross court angle hits had she chosen to do so. When a team makes a decision like this it usually isn't a random choice that just happens. 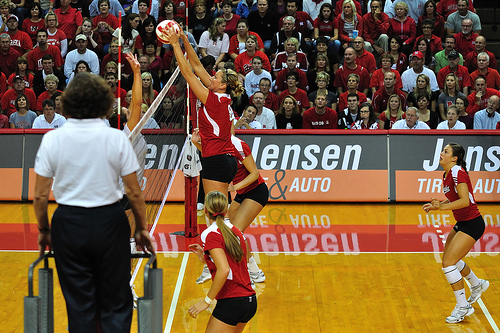 It's a part of a team's defensive plan, which includes the volleyball blocking strategies they choose to follow. 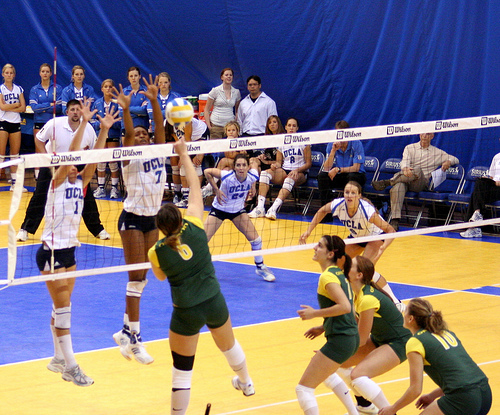 Blocking strategies are usually chosen by the head coach and are practiced in team defensive drills the week leading up to a match. The team defensive volleyball blocking strategies that your coach decides to have your team use will depend on the scouting report he or she has which explains what the opposing hitters tendencies are. The team studies a scouting report together usually in meetings while the players watch video of the opposing team's offense and defense. They watch video and take notes and develop an understanding with guidance from their coach about what the opposing team does in certain circumstances, what their tendencies are, what their weak points are and what their volleyball blocking strategies are. The scouting report will usually answer some of these types of questions. Does this team win points by hitting cross court? Is one particular hitter efficient in scoring points by hitting down the line? If so, what jersey number does she wear? What quick sets does this team like to run from the middle? What's the player's jersey number who runs the middle plays? What type of back set does the setter like to give her right side player? Will our team block the right side player to stop her attack or will they block her strategically which means will they take away a certain area of the court forcing the left handed spiker to hit at an angle that isn't in her comfort zone and will be alot easier for your defensive players to dig up? Does the setter like to dump the ball? If so when does she like to do it? Does she dump the ball during a rally or off of her passer's first receive pass? Which hitters hit from the back row and what jersey numbers do they wear? What percentage of their attacks do they hit cross court from the back row and which down the line? Which players like to serve short? Which players jump serve? 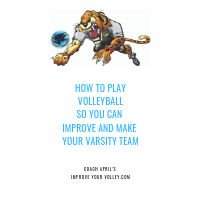 This is just a sample of some of the questions that need to be answered so that a coach can establish which team blocking and defensive strategies the team will implement in their next match. 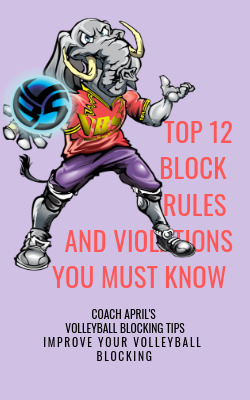 Based on the scouting report the coach may assign you, the middle blocker, to a particular hitter or will tell you when to block or not block another opposing hitter. The coach may tell your teammate to help you block a particular opposing hitter when she's in the back row because she gets set in the back row a lot. 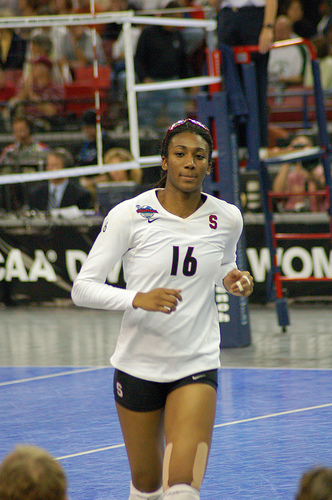 Whether you are on a team with a coach who decides the defensive strategies or you are on a team where the players make the choice, as a middle blocker in volleyball, its important for a decision or a game plan to be formed, a strategy developed so the front row and the back row work together in defense and everybody is on the same page about each other's responsibilities. Or visit the pages in the Strategysection in the drop down menu at the top of the page to get started.